BIAFRA: NOW THAT BINTA HAS DECLARED IPOB LAWFUL, WHAT HAPPENS TO THE SLAIN? As we rejoice and are gladdned by the recent court ruling of Justice Binta declaring IPOB as lawful, i am still pondering on the atrocities committed without previous conviction and clarification of any kind against we the Biafrans. Many promising lives have been destroyed and many more slain by rains of bullets pelleted by the Nigerian military and police force. Fathers, sons, mothers, girls and children have harshly been brought down for committing no crime, theft or murder, talk less of carrying out a coup d'etat. Yet, in all this bid to silence and destry freedom of speech and association, many lives of innocent citizens created by God for a purpose were cut short untimely, therefore i ask, now that IPOB is not illegal, will these killers be brought to book? 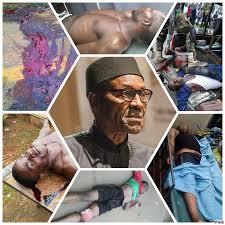 Will families of slain Biafrans be compensated? Will their death mark the beginning of active groups and NGOs rising to fight justly for the oppressed? In Nigeria, crime by selected personnel are often swept under ththe carpet. The victims are often made scapegoats and the oppressors with money and connection get away with various degrees of crime, including murder cases. In Nigeria, corruption is a celebrity with the leaders as clowns happily waving, clapping and cheering her wholeheartedly. All my wounded and maimed brethren, the captured, kidnapped, abducted and detained victims, what will happen to them? Will they be compensated, will their medical expenses be refunded, will their businesses be refunded? Will their demolished homes be rebuilt? Until, justice is served and delivered, our joy will not be complete.